Continuing directly where the first chapter of The Game Kitchen's point-and-click horror adventure game left off, The Last Door: Chapter 2 finds our hero worse off than before. Plagued by strange dreams that his visits to a therapist only seem to make worse, he continues his quest to find out what went so horrifyingly wrong with his childhood friend Anthony. He returns to the boarding school he and Anthony once attended together only to find it now converted into a church, but inside he may find more secrets than sanctuary. Just click to walk around, and when the cursor changes, you can click to interact. Items will be automatically added to your inventory when you get them, and you can click on them to select, and then again in the scene wherever you'd like to use them. Chapter 2 brings a few gameplay improvements over the original, perhaps most noticeably being a faster walk speed players will appreciate. The conversations are a nice touch that help shed light on characters and establish tone, despite being rather flowery and elaborate, but most dialogue options seem perfunctory when you simply have to exhaust them or pick the right one without consequences for the wrong one to advance. What hasn't changed is the game's fantastic atmosphere (and yes, there are still jump scares), though this chapter is a bit more slowly paced and devoted to foreshadowing early on as you explore the school and learn more about the people now living there. It's a bit longer than its predecessor, largely because so much time is spent exploring and talking to people, and while the mood remains ominous, it's not quite the tense crawl the original offered. At least... not right away. The Last Door: Chapter 2 contains content some players may find upsetting, though perhaps not as much as chapter one's infamous opening scene, but play with caution and respect others' opinions when you voice your own. The game ends on a rather Jonathan Strange and Mr Norrel-y note, but ups the stakes considerably and expands the world (and the mystery behind it) in a compelling way. Eerie, unsettling, though still perhaps over too soon, The Last Door: Chapter 2 is a solid example of classic horror at work. Though Chapter Three has been released, it's currently only available to people who donate towards funding the next chapter in the series, and will be released freely for everyone when Chapter Four is released. The series will follow this release model until it's finished, and we will wait to cover each chapter until you can play it freely. "Enhanced" versions of each chapter containing sharper visuals and translation options are available on the site. More information is available here. 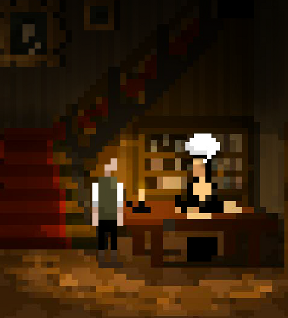 The Last Door: Chapter 2 Walkthrough now available! First pick up the whip on top of the table. Next, place the priest's robe on the coat hanger beside the door. Click the candle-lit altar to kneel at it. Lastly, click the father three times to whip him. Walk right until you find a hanged man. Click the man to make him disappear. Continue right until you reach a woman and child. Approach them to make them disappear as well. Walk right until the psychiatrist wakes you up. Choose either dialogue option to complete the scene. Search the mailbox beside the entrance gate. Read the letter inside, then take the POSTCARD to add it to your inventory. Continue left to the fountain. Pick up the broken STONE eagle on the ground beside the base of the fountain. Don't enter the building just yet. Instead, walk left around the side of the building to reach the Graveyard. Click the groundskeeper to speak with him. You can choose to ask him some questions or leave him to his work. Continue left to walk to the Shore. Walk a little to the left towards the large rock. Pick up the NET from the ground by the bottom of the rock. Move further left towards the edge of the water. Take the small LOG from the sand. Go back to the Front Yard, then enter the Lobby through the front door of the building. Talk to the nun seated at the desk. Tell her "I prefer not to talk about it" to gain her permission to explore the building. Walk left to enter the Hospital area. Talk to the man in the far left bed and the woman at his side. Give the POSTCARD to Matthew Vinge. While his sister is distracted reading the letter, search the blue bag at her feet to find a packet of LETTERS. Give these LETTERS to Matthew as well. In exchange, you will receive his lucky COIN. Walk to the right end of the room, then speak with the nun by the last bed. She won't let you talk to the patient, but she does seem very interested in the statue of the Virgin Mary beside her. We'll have to find a way to interact with it later. Click the back door (which leads to the Graveyard) to unlock it, but do not go outside just yet. Open the door on the right and go through the doorway to enter the Classroom. Examine the bookshelves by the door to find a MUSICBOX. Read the letter on top of the far right desk. Walk left to the end of the room, then click the diary page on the desk to read it as well and to find an eerie photograph. Exit the room and walk all the way back to the Lobby. From there, go up the stairs to the second floor corridor. Open the first door on the left to enter the Nuns' Room. Speak with the nun standing by the window. Neither dialogue option will appear to comfort her, but you have something else that can cheer her up. Use the COIN to wind up the MUSICBOX and play a melody for the forlorn nun. After the nun leaves, click the window to look outside. Inspect the broken pipe under the window, then pull out the clump of leaves blocking it. Hit the pipe with the STONE to blunt the sharp edges. Put the NET in between the pipes to catch any objects floating in the water. Step away from the window and exit the room. Continue right to the end of the corridor, then open the doorway and enter the Bathroom. Examine the broken mirror hanging on the wall to the right of the doorway, then click the MIRROR again to add a piece of it your inventory. Look at the puddle in the lower right shower hole to discover something glinting. Click the tap of the shower above the puddle to turn on the water and flush the shiny object into the pipe. Exit the bathroom, walk to the left end of the corridor, then re-enter the Nun's Room. Search the net between the pipes to find the shiny object you flushed down the shower hole in the Bathroom. Click the net again to take the TEARDROP. Back up from the window and leave the room. Go left to return downstairs, then walk left again to enter the Hospital. Walk right to the statue of the Virgin Mary beside the last patient's bed. Place the glass TEARDROP on the statue's face. Use the MIRROR on the statue to reflect the light from the window on to the tear. The nurse will see the tear and run from the room, allowing you the speak with the bed-ridden patient. If you choose the first dialogue option, "I don't know if I'd have the courage to do that," your character will refuse to euthanize the patient. Go back to the Lobby, then speak with Mother Elizabeth at the desk. She will give you a BIBLE to pray for the patient. However, if you choose the second option, "I guess I could find the courage to help you," he will agree to euthanize the patient. You will need to go upstairs and into the Nun's Room. Take the syringe of MORPHINE on top of the chest of drawers. After you've received whichever item that goes with the choice you made, return to the sick patient in the far right bed at the Hospital. Read the note left behind on his bed. Go out the left door to the Graveyard. When you enter the scene you will hear knocks coming from inside the closed coffin. Your character doesn't have any way to get it open yet, so for now walk right to the Front Yard. Examine the toolbox by the groundskeeper's feet. He won't let you touch his things, so we'll have to find a way to distract him. Now click the groundskeeper to talk to him. Select the dialogue choice "Tell me about this place." Next, select the choice "Tell me about Aberdeen." While Baldwin is talking, quickly take the NAIL TOOL from his toolbox. Walk left to go back to the Graveyard. Use the NAIL TOOL to open the coffin. Mother Elizabeth will run out to help the collapsed patient. While she's busy, go right to the Front Yard and then through the front door into the now unattended Lobby. Search Mother Elizabeth's desk, then click it again to take the KEY. Use the KEY to unlock the door on the right. Go through the door to enter the Hallway. Walk left and talk to all three of the boys in the hall. Open the door to enter the priest's room, which will take you back to the start of the hall. Go all the way left, open the door, and enter the Priest's Room once again. "Now, my son, tell the Lord which one is his voice: The sharp sword, the wise quill, or the delicate petal? The answer he wants to hear is "The sharp sword." "And now, my son, tell the Lord which one is his holy path: The wise virtue, the endless blame, or the blessed penance? The answer he wants is "The endless blame." "And now, my son, tell the Lord who are you: The faceless pilgrim, the gate guard, or The lost seaman?" The answer he wants is "The lost seaman." After he kicks you out, simply go back through the door to re-enter the room. You're not wanted in here now, so you'll have to move carefully to remain undetected. Wait until Father Ernest is making noise himself so he can't hear you. When he coughs, walks about the room, or talks to himself, you must quickly move to the cabinet by the door. Search inside the cabinet to find a bloody RAZOR. Exit the room and walk all the way right to leave the hall. From the Lobby, go up the stairs to the Corridor. Walk right until you reach the long tapestry that partially covers the floor, the one your character remembers from his school days. Attach the RAZOR to the LOG in your inventory to combine them into a CUTTING TOOL. Use the CUTTING TOOL to slice open the long tapestry, revealing a hidden door. Go through the hidden door to enter the Dormitory. After the cut scene, walk right to the end of the room. Get into the bottom bunk of the bed against the wall to go to sleep. In the dream sequence, read each note beside the flickering candles on the floor. Go out the door into the corridor, then read the notes by the candles of this area too. Go down the stairs to the lobby and read the one note here, then continue left into the hospital. Read the four notes on the floor and then go through the bloody door to enter the classroom. Read the last note. Click the secret doorway in the floor to begin another cut scene. After his, your character will wake back up in the Dormitory. Exit the room through the door on the left, then walk all the way back to the Classroom downstairs. Move left to the teacher's desk, then lift the rug on the floor in front of the desk to reveal a hidden passage. Open the trapdoor and go down to the Cellar. Click the sick patient by the foot of the stairs. This is the same patient who asked to be euthanized in the hospital. If you agreed to get him morphine, you can use it on him now. If you refused to kill him, he will die when you enter the room. Walk to the right and go through the opened doorway. Accessibility options are off the hook!!! Yeah! For some reason I missed that there was a handle to turn. I figured there was a key, but it took me so many tries to find it. It was right where I thought it was. All these might help cut down all the back-tracking I did. Some inevitable speech redundancies, but nothing too off-putting. Also it's more like a series of paintings than a side-scroller, so occasionally was facing a different direction than from the previous screen. Love the shout-out to an obvious forebear of this art. And just: love it! is going to give me nightmares FOREVER. Love it. But totally not for anyone planning to sleep at night. Almost as disturbing as the last one. Almost. @Shudog: I agree completely. It's a very good thing that I don't sleep anymore. groundskeeper at the front of the house. the options say i'm supposed to ask "tell me about this place" and "tell me about Aberdeen" I think the place itself is the only option,because I can't go further. The walkthrough is correct, but you skipped the first step! look at the toolbox first so your character knows he needs to make a distraction. This will open the dialogue choice to ask about Aberdeen. clicked on the toolbox he said something about he'd like to get something from it or something like that. so it did confirm I clicked on or looked at the toolbox. i'll try again as there was no save so i'll have to play it all over again. Hmm... that's odd. Well, let me know if you run into the problem again and we'll see if we can't find another way around it. When I was going through that section myself at the time of writing the guide, I remember that I forgot to check the toolbox and the Aberdeen speech line wasn't there, then I clicked the toolbox immediately afterwards and the Aberdeen line appeared. There may be another prerequisite, like trying to open the coffin, perhaps. you couldn't use the morphine to alleviate the far right patient's pain. Morphine is an opioid commonly used in hospitals to alleviate severe pain, and my mind went straight to "Oh, I can use the morphine to help with his pain! ", not "Oh, I can use the morphine to euthanize him!". Morphine would only kill a person given an extreme overdose, but then so could a lot of things. It's really a great game with amazing atmosphere and musical direction, but my biochemist side couldn't get over that. You need to try to open the coffin with the log. Then when you click on the toolbox you'll want to distract Baldwin, and then you'll have those dialog options. Oh my goodness. I'm not usually a fan of horror, but these are so well done. The atmosphere is incredible and the puzzles are all logical, but not too easy. The kind where you can go away from the game not knowing what to do, but come back later, explore some more, and find your way through. Perfect! I agree re: the morphine. Having been in the hospital and having needed morphine, I hoped that I could tell the patient I wouldn't kill him, but then come back and relieve the pain anyway. If THAT wasn't enough, THEN I might help him the other way. Could someone help me out a little? When I get to the front of the house to talk to the groundskeeper, I can't get the dialogue that asks me to distract him when I click his toolbox, nor can I get the "Ask him about this place" or "Ask him about Aberdeen" dialogues. I only get to ask him about Monsignor. It looks like you are probably having the same troubles that Paul was having. You are definitely stuck at the same place as him, anyway: try reading his comments and both replies directed at him, including everything in spoiler tags. FYI, that goes for anybody following the walkthrough and stuck at the place where you are talking to a person in front of the house but options seem to be missing. Just a thought, - and I'm not going to replay to verify this - perhaps you can only talk to Mr. Baldwin about Aberdeen, if you've looked out the window and seen that you are near Aberdeen? that ending nightmare scene that made me want to run screaming and/or pee my pants. I'm kind of comforted to know I wasn't the only one who felt that way. jump scares and terrifying images in the mirrors. I would like to offer a warning, though. Parents, please don't let your young kids play this. True, it keeps the jump scares to an absolute minimum, which is what attracted me to it in the first place, but the content is extremely disturbing at times. If what you are looking for is a light horror distraction for the season, this might not be the best choice. Again, I am not attacking the game itself. If others like it that does not offend me. I just want to put in my two cents since I've been given the opportunity. I too am stuck at the same spot and have done all 3 actions mentioned above to trigger the option...no go...when I find the answer for me...I'll post it here. I was like Ok, prepare for screamer, during nightmare scene, and I was STILL Scare!! solved by going back to the coffin, and examining it, then it will trigger the search for the nail tool and the option to talk the mr. baldwin about aberdeen. screaming eye at the start scared me half to death new something was going to happen wasn't expecting that. So sorry I previewed thinking there would be a spolier font etc...couldn't figure it out and was rushing...I was so flustered about game...so sorry. Also I thought it may be helpful tell you what it says over and over again when I try to talk to the patient on the far right. "Sir?...He looks too weak to keep talking, he seems to be asleep". So I got almost to the end, and the wheels fell off. Any advice? on the black screen, you can hear the handyman load your unconscious body into a coffin, nail the lid down, dump the coffin into the grave he had been digging, and shovel dirt onto it. It's a relatively long cutscene(cutsound? ), which might be the issue.